The thing that has been holding my husband and I back from upgrading to a larger TV is trying to figure out where to put it. 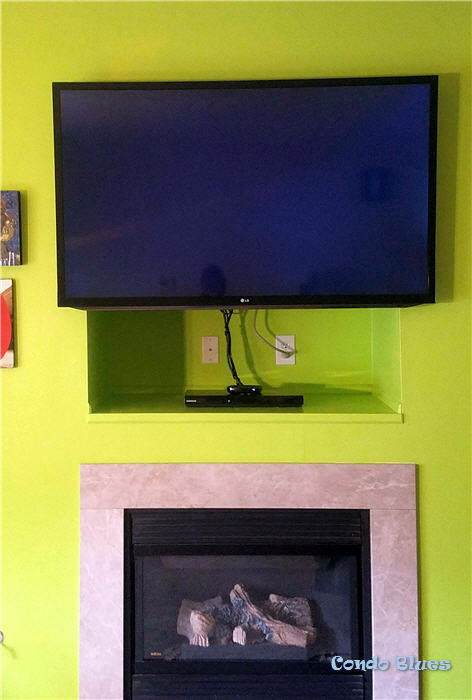 We maxed out the TV hole in the wall above our fireplace with a 30 inch flat panel. We honestly don’t have any other place in our small living room for an entertainment center or to hang a TV but in our wall niche. Our in laws upgraded to a Roku TV similar to these and we offered to buy their old one if they didn’t already have plans for it. We have a Roku Ultra (you can learn more about the most versatile streaming device my research told me here) and already planned on buying a new movietastic TV anyway. Their upgrade was the kick in the seat we needed to finally get our project moving along instead of putting it off again. Oh that and it turns out you CAN mount a large flat panel television in a small built in TV niche without framing in the niche and turning the TV nook into a fake wall. Electric drill and drill bit – I upgraded to a Dewalt electric drill like this one and then my husband gave me 100-piece Impact Screw Driving Bit Set for Christmas because he is the best guy ever! 1. 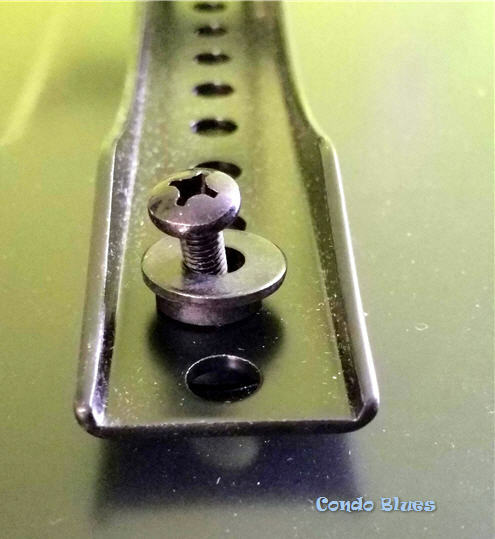 Assemble the TV mount with the carriage bolts to fingertip tight. I found it easiest to attach the TV mounting bracket to the side “wings” face down in my TV niche. This way I could easily make the side wings that attach to each side of my TV niche the correct length. Don’t tighten everything down just yet. 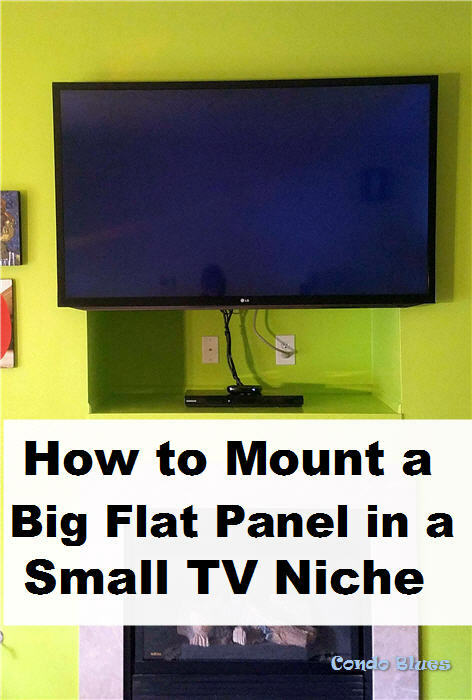 You may need to make minor fit adjusts before it is time to heft your TV onto the wall mount. 2. 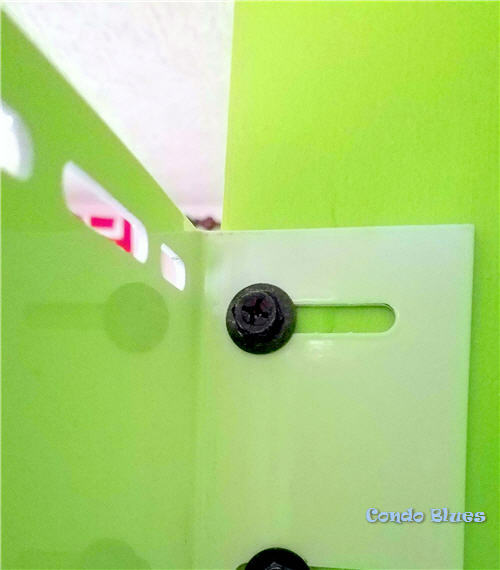 Use the screwdriver and four of the corresponding size screws for your television to attach the mounting arms to the back of your television, with the tilt lever pointing down towards the floor. The mount comes with eleventh billion screws of different lengths and sizes to chose from. It also includes washers and spacers if the corresponding screws for your television aren’t quite the correct size. 3. 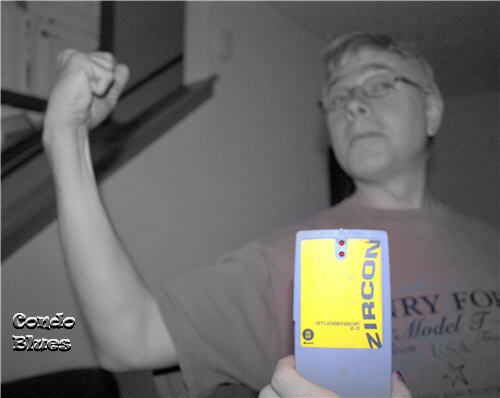 Use the tape measure to measure the vertical height of the back of your television and wall niche. 4. Use the pencil to mark the wall where you want to install the TV mount on both side of your TV niche. 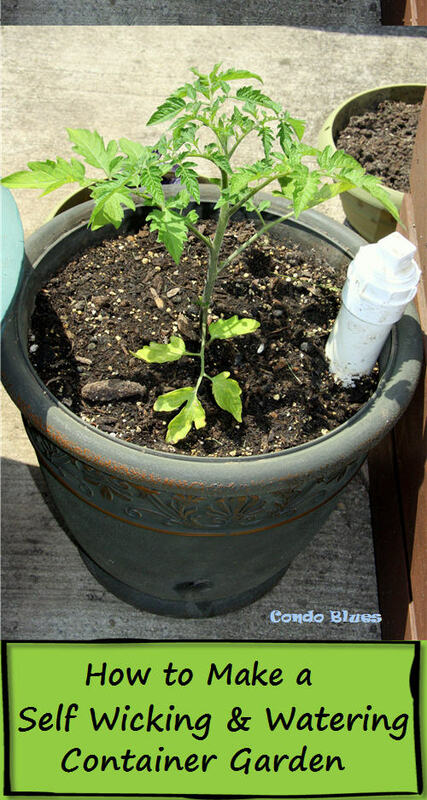 This is where your helper and carpenter’s level comes in handy. I found it best to have my husband hold the mount while I checked if it was level and marked where on the inside edge of the TV niche I needed to drill the holes to mount the niche bracket. 5. Use the drill and drill bit to drill the six mounting holes you marked into the studs framing the TV nook. You really need to use all six lag bolts (3 on each side per the manufacturer) to bolt the mount into your niche, unless you want your expensive and stupidly heavy Jumbotron crashing to the ground. I can’t speak for you, but I’m guessing that’s a no. 6. Use the socket set, the holes you drilled Step 5, and your second set of hands to hold the winged bracket in place while you securely bolt the winged TV bracket to the inside edge of the TV niche. 7. Now is the time to double check and make adjustments to mounting bracket on the wings and securely tighten the 8 carriage bolts that hold everything in place with the socket set. 8. Swivel the bottom portion of each mounting arm to the side which will help you lock the bottom of the mounting arms to the bottom of the wall mount. It is much easier to do this before you and your helper are balancing on step stools and struggling to figure out why the bottom of the mounting arms won’t latch on the bottom of the niche mount while trying to to drop an extremely heavy object. Unless that’s your jam. Then have at. 9. 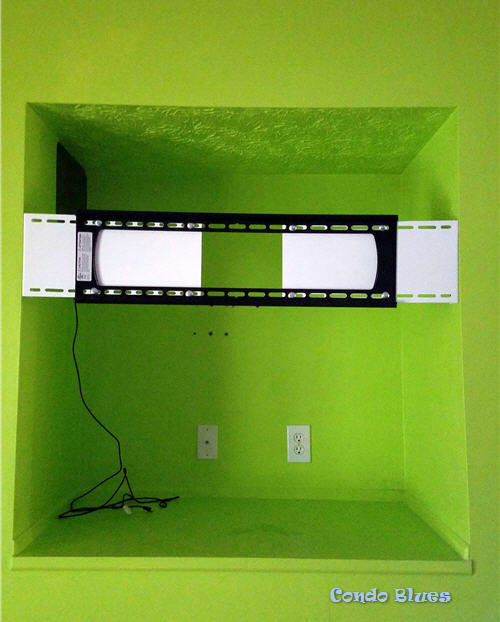 With your assistant, lift the television and hook the top of both mounting arms onto the top of the niche bracket. Then swivel the bottom of the mounting arm into place under the bottom of the niche bracket to lock it into place. 10. 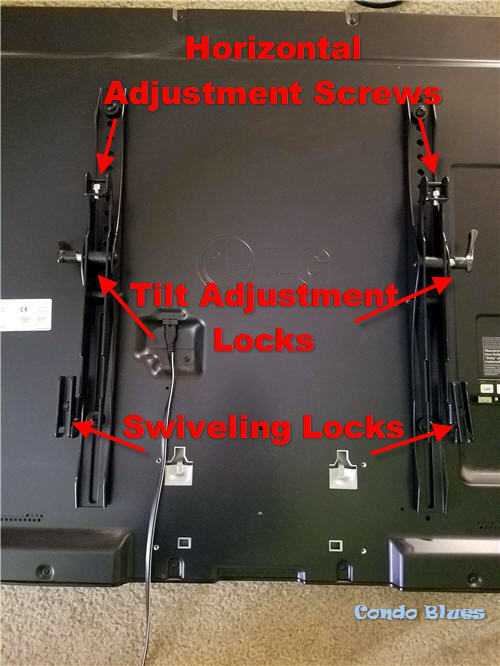 Adjust the television’s tilt from the wall using the tilt adjustment levers on side of each mounting arm and level it using the GIAGANTIC Allen wrench included in the kit to adjust the alignment screws on the top of each mounting arm. 11. Plug in your television, hook up the components if needed, and have a movie night! Looking for more small space home theater ideas? Check out the following options - and more! - below! This is really useful. 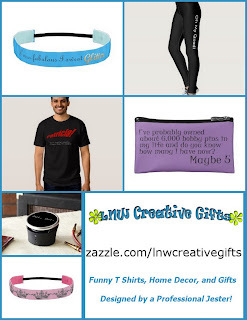 Thank you for sharing the tips at The Really Crafty Link Party this week. Pinned.